Very beautiful crag of excellent rock climbing varies, notches, holes, blades, and flares. Climbing purely technical but that does not disdain harder blocking steps. 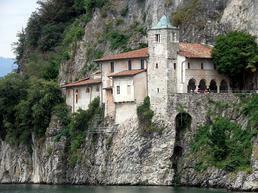 Access: To reach the cliff you have to get to the hermitage of "Santa Caterina del Sasso Ballaro". To reach the place take the A8, exit at Vergiate-Sesto Calende, continue for the village of Laveno, passing the various countries that you meet (from Angerafino to Leggiuno). Always following the signs for the hermitage, take the last junction that leads into a small dirt road. Continuing for about half a kilometer, you park your car at the first distance and continue on foot, returning to your feet. 'Go along a gray gate for 100 meters and take a small path on the right (it is not the dirt). From here you go up a small and steep path in the woods and, along a metal fence, you reach a lake view point where you see a small man. You go down then continuing for 50 meters towards the left. Shortly before a clearing suddenly turns right, there is another small sign and go down a steep path following the black pipes. Attention after a piece of steep path downhill, protected with ropes, you reach the black pipes and come to their concrete base, continuing left along the path you reach the various sectors. Going straight on, however, you reach the Saigon sector. It takes about 15 minutes from the car. NB very steep and sometimes slippery path to use suitable footwear! Exposure: South-West exposure. The cliff is purely winter but, being close to Lake Maggiore, has a relatively mild climate allowing climbing in other periods.